Intel Report on the Borgward BIV, with 6 photos. "Recently four German radio-controlled demolition vehicles were encountered in Germany. 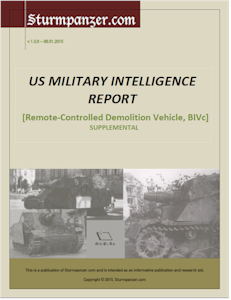 The vehicles have been identified from photographs as the B IV demolition vehicles. All four vehicles were knocked out by A. P. tank destroyer fire and did not explode: two were later exploded when hit by H.E. shells."